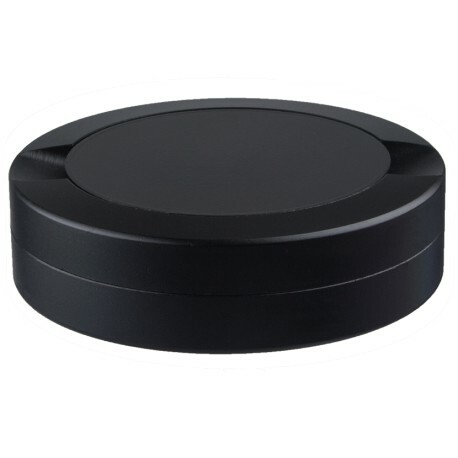 Carry your snus in cutting edge style with the DUS Aluminum Black Snus Can with Catch Lid! DUS Snus Cans have character. If you're lucky, you'll get one with small internal die marks or unique marking and imperfections lending to the industrial character of the cans The seals are perfect so your snus well be preserved despite the industrial design. Most importantly, check out the incredibly LOW price! Buy 2 and carry them at the same time! Moe negotiated the purchase over drinks which is when he is at his best and the seller is at their worst! That's why we keep Moe around. Dump your cheesy plastic snus cans and switch to the rich looking DUS Aluminum Snus Cans; now available with and without catch lids! Don't get my average rating wrong - it's beautifully constructed. Nice thick aluminum, tight seals, generous catch lid, wonderful finish. It's just too short by about 4mm. I know that sounds nitpicky, but the catch lid hole (is there a term for that?) goes down too far - I'm not able to fit a full can of snus in there. Or rather I can, but I have to practically sit on it to get it to close up. I'll still keep this around as a going-out can, but I'd love to see a version that has the same inside volume as a regular snus can.